©Copyright 2017 Tom Janssen – All Rights Reserved. 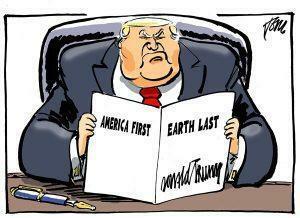 Last week saw the President of the United States of America Donald Trump withdraw from the Paris Agreement on Climate Change. Out of 200 countries, only three have rejected the Paris Agreement- Nicaragua, because it didn’t go far enough, Syria, which is in civil war and now the United States of America. Even North Korea has signed up, which shows just how out-of-step President Trump is with the rest of the world. The diplomatic repercussions are only just beginning for America failing to honour a global agreement that it helped forge. One of the successes of the Paris Agreement is that it built the bridges between developing and industrialised nations. So never before has the world been so united in action to maintain a safe climate. By withdrawing from the global agreement, America has lost its seat at the head at the table and will be standing outside the negotiating room. Renewables are cheaper than new coal and continue to drop in cost. The future is renewable power – no matter whether you pretend it isn’t. Ironically American business has been at the forefront of renewable energy development. Data shows that renewable energy generation directly and indirectly employs nearly 3 million Americans. So Trump’s return to the ‘golden ages’ of coal industry sets him on a collision course with the burgeoning liquefied natural gas industry and a strong renewable energy industry. Research in the Mediterranean has shown evidence of climate change already changing sea turtle nesting areas. Loggerhead sea turtles have steadily begun nesting beyond the northern edge of the species’ range in the Western Mediterranean basin. This is associated with a significant warming of spring and summer sea surface temperature. Studies in the important nesting areas of Zakynthos Greece, has shown that climatic changes to sea turtle habitat will have an overall negative impact. To safeguard this precious flagship species, action on climate change is needed. The argument about climate change has passed. Global action on climate change has been cemented by the Paris Agreement and won’t be ‘Trumped’. As the United Nations Secretary-General Antonio Guterres stated, “get onboard or get left behind”.